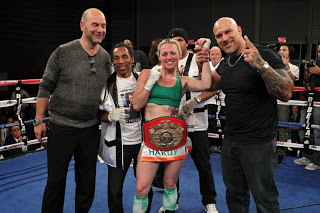 When I last checked in on female boxer Heather Hardy, her celebrity was certainly on the rise but she was just scratching the surface of where her talent in the ring could lead her. At the time she was 6-0 (1 KO) and preparing for her first title bout. Her focus wasn’t only about becoming a champion but also in becoming a leader in the brand of women’s professional boxing. Fast forward nearly seven months later and the ever humble Hardy has stayed true to herself, family and management team to capture three more wins and is the current UBF junior featherweight title holder. Now she is getting an opportunity to merge her goals of champion and brand leader by becoming the first woman to fight in Brooklyn’s Barclays Center on June 14. Hardy’s fight will be on the untelevised undercard of the Ruslan Provodnikov and Chris Algieri main event being covered by HBO’s Boxing After Dark. Still Hardy’s appearance on the fight card itself represents forward movement in the perception of women’s boxing. This is a ground breaking achievement for the brand that has suffered gaining even sparse popularity since Laila Ali hung up the gloves. The world of sports is a dynamic place but sometimes it’s hard to change the opinions of those in power to try something new. Hardy is quickly becoming that change because she can fight, she is well spoken and she cares about the sport of boxing. It’s just a matter of time before she and other women like her carry the sport to the main stage where all can rightfully enjoy.